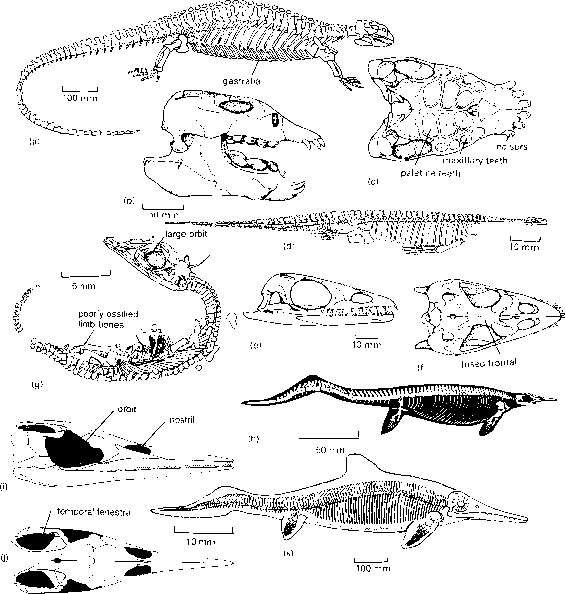 There were four main groups of reptiles in Triassic seas (McGowan and Motani, 2003; Rieppel, 2000c), the placodonts, pachypleurosaurs, nothosaurs and ichthyosaurs, all of which have the euryapsid skull pattern (see p. 112), with one (upper) temporal fenestra. Each has very different aquatic adaptations and they represent a major radiation of marine predators, probably from independent sources among the early diapsids. Late Triassic reptile communities are important because they document a major transition from faunas dominated by synap-sids, basal archosaurs and rhynchosaurs to the new dinosaur-dominated faunas. An example is from the Lossiemouth Sandstone Formation (Carnian, c. 225Myr ago) from Elgin in north-east Scotland, a fauna of eight reptile genera (Benton and Walker, 1985). The fossil bones were found in a fine-grained whitish-buff sandstone that was evidently deposited in sand dunes by the wind, rather than in water, because it shows dune bedding and the sand grains are well-rounded. Initially, the Elgin reptiles were studied as they were found, without any preparation. Then a number of specimens were cleaned up by removing the rock with chisels, but this was not successful because the rock is hard and the bone is soft. Alick Walker pioneered a casting technique in the 1950s and 1960s in which the soft and incomplete bone was removed by the use of acid, leaving near-perfect natural moulds in the rock. Casts were taken in flexible rubber and plastic compounds; these show exquisite detail of the bone surface (illustration I) and they are easier to work with than bone as they are not fragile. The details of the anatomy of Stagonolepis, Ornithosuchus, Hyperodapedon and Scleromochlus described by Walker (1961, 1964) and Benton (1983b, 1999a) have been obtained largely by these techniques. 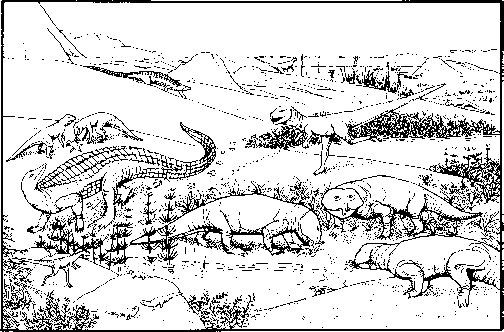 The dominant animals in the Elgin fauna (illustration II) are the rhynchosaur Hyperodapedon (Figure 6.5(c-g)) and the ae-tosaur Stagonolepis (Figure 6.3(d, e)), both medium-sized herbivores that fed on tough vegetation which they may have dug up with their snouts and powerful feet. The main predator was the crurotarsan archosaur Ornithosuchus (Figure 6.3(c)), large specimens of which could have attacked either of the herbivores. 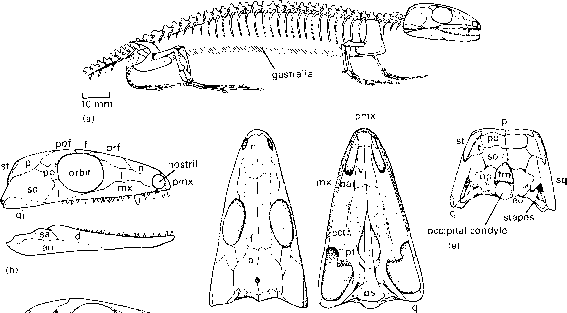 Three small reptiles, the procolophonid Leptopleuron, the sphenodontian (see pp. 237-8) Brachyrhinodon and the or-nithodiran archosaur Scleromochlus (Figure 6.8), were each about 150-200 mm long and represented 5-25% of the total fauna. Leptopleuron may be seen as a 'reptilian rodent' with its broad grinding back teeth and chisel-like front teeth. I Close-up views of specimens of Hyperodapedon from the Upper Triassic of Elgin, north-east Scotland, to show the quality of preservation of surface detail: (a) premaxillary beak (left) and maxilla (right), showing striation on the premaxilla and blood vessel openings in the maxilla; photograph of PVC cast (x1.3); (b) the lacrimal (tear) duct leading from the eye socket (top) into the nasal cavity (below); photograph of natural rock mould (x3.0). Brachyrhinodon has sharper teeth, probably for chopping small plants. Scleromochlus has long slender legs and it may have been able to leap around in the moving sands on the edges of the well-watered feeding grounds. These small animals were probably preyed on by young Ornithosuchus, by the very rare archosaur Erpetosuchusand the possible dinosaur Saltopus. Read more at http://www.morayfirth-partnership.org/mfptreasure/infozone/56.htm, a very brief account of the Elgin reptiles, and http://aleph0.clarku.edu/huxley/guide6.html, a quirky guide to Thomas Henry Huxley, the great Victorian anatomist, and his early work on the Elgin reptiles. The placodonts were also most abundant in the Mid-Triassic of central Europe, some Mediterranean areas and southern China, and disappeared during the Late Triassic. Placodus (Figure 6.7(a)) looks at first like a heavily built land animal, but its remains are found in shallow marine beds. The tail is not deep, as might be expected if it were used in propulsion, and the limbs are not modified as paddles. The limb girdles, although heavier than in the nothosaurs, are not as firmly attached to the sides of the body as one would expect in a terrestrial form. The heavy array of gastralia covering the belly region is a feature shared with pachypleu-rosaurs and nothosaurs. Some placodonts carried massive armour shields over their backs, composed of polygonal bony plates. Fig. 6.6 Cladogram showing the postulated relationships of the major diapsid groups, based on the work of Benton (1985), Laurin (1991),Dilkes (1998) and Rieppel (1998). 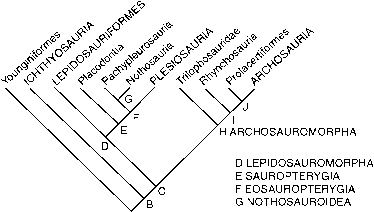 See Box 5.1 for context ofNeodiapsida; see Box 6.1 for phylogeny ofArchosauria. Synapomorphies: A NEODIAPSIDA, anterior process of squamosal narrow, trunk ribs mostly single-headed, ends of humerus robust; B,external nares close to the midline, sphenethmoid absent, presacral intercentra absent, entepicondylar foramen in humerus absent, radius as long as ulna, fifth distal tarsal absent; C, tabular absent, squamosal mainly restricted to top of skull, quadrate deeply emarginated posteriorly, stapes slender, cleithrum absent, lateral centrale in hand small or absent, fifth distal tarsal absent, fifth metatarsal hooked; D LEPIDOSAUROMORPHA,supratemporal absent, teeth absent on transverse pterygoid flanges, dorsal intercentra absent, thyroid fenestra in pelvic girdle; E SAUROPTERYGIA,premaxilla large, lacrimal absent, upper temporal fenestra larger than orbit, lower temporal fenestra open ventrally, anterior premaxillary and dentary teeth procumbent (slope forward), cervical intercentra absent, three or more sacral ribs, clavicles positioned anteroventrally to interclavicle and meet medial surface of scapula, humerus curved, humerus with reduced epicondyles, radius and ulna of equal length, fifth metatarsal long and slender, straight fifth metatarsal; F EOSAUROPTERYGIA,zygosphene-zygantrum articulation, pedicels of neural arch received on 'butterfly'-shaped platform on centrum, clavicles with anterolaterally expanded corners, scapula constricted in the middle, entepicondylar foramen, three tarsal ossifications; G NOTHOSAUROIDEA,quadratojugal without anterior process, occiput plate-like, clavicles broad medially, coracoid strongly waisted; H ARCHOSAUROMORPHA,posterodorsal process on premaxilla, sagittal crest, slender and tapering cervical ribs, notch on anterior margin of interclavicle, small anterior process and larger posterior process on iliac blade, medial centrale in carpus absent; I,ectopterygoid expanded posteriorly, upturned retroarticular process, second sacral rib bifurcates and posterior process truncated sharply, anterior apron of pubis; J,long snout and narrow skull, nasals longer than frontals, recurved teeth, extensive participation of parasphenoid/basisphenoid in lateral wall of braincase, long thin tapering cervical ribs with two or three heads and an anterior process. maxilla, four heavy teeth on each maxilla, three on each palatine and three or four on each dentary. These palatal teeth are broad, flattened and covered with heavy enamel. They were clearly used in crushing some hard-shelled prey, most probably molluscs and bra-chiopods, which were levered off the rocks in shallow coastal seas with the incisors, smashed between the massive palatal and posterior dentary teeth and the flesh extracted. The broad triangular skull is of such a shape that the maximum biting force occurs just in the region of the largest teeth on the palatine and dentary, and the extended squamosal probably bore powerful jaw adductors that ran forwards to the high process of the dentary. These muscles then ran nearly horizontally and they would have provided a powerful backwards grinding pull to the lower jaw. (Figure 6.7(d)). They are best known from the Middle Triassic of central Europe where animals such as Pachypleurosaurus have been found abundantly in marine sediments (Carroll and Gaskill, 1985; Rieppel, 1995). These 0.2-1 m-long animals were clearly mainly aquatic in adaptations, using wide sweeps of their deep tails to produce swimming thrust. The forelimbs may also have been used to some extent for thrust and steering. The hindlimbs were probably held along the sides of the body most of the time in order to reduce drag. The limb girdles are very much reduced and they are only lightly attached to the sides of the body, so that they could not have supported the animal's weight on land. The skull of pachypleurosaurs is long and lightly built with a very large orbit and nostril, but a small temporal fenestra (Figure 6.7(e, f)). The pointed peg-like teeth are spaced fairly widely and project at the front of the jaws. They suggest a diet of fishes that the agile pachypleurosaurs could have chased and snapped up with darts of their long necks. Among the abundant remains of pachypleurosaurs from Switzerland, Sander (1988) found a specimen of a young animal, less than 50 mm in length (Figure 6.7(g)). The specimen shows two key features that prove it is a juvenile: the orbit is relatively large and the limb bones are poorly ossified. Perhaps this juvenile had just been born, or it may even be an embryo. The larger nothosaurs (Rieppel, 1998), 1-4m long, had elongate heads and large temporal fenestrae, but were otherwise similar to pachypleurosaurs in their adaptations. They appear to be closely related to ple-siosaurs, a group that first appeared in the Mid-Triassic, and radiated dramatically in the Jurassic and Cretaceous (see pp. 245-6). long basal form (Figure 6.7(h-j)). It shows typical ichthyosaurian characters of about 40 cylindrical pre-sacral vertebrae, and limbs and girdles shortened and broadened to act as paddles. In the skull (Figure 6.7(i, j)) the orbit is large, the nostril is placed well back from the tip of the snout and there is a single high temporal fenes-tra. The jaws are long and narrow and lined with uniform peg-like teeth. Primitive features, hinting at the land-living ancestry of ichthyosaurs, are that there are two sacral ribs and the hindlimb and forelimb are of roughly equal size. In later ichthyosaurs, there are no sacral ribs (the hip joint is completely separated from the vertebral column) and the front paddle is larger than the hind. In later forms too the snout became longer, the teeth more pointed, the orbit larger and the bones at the back of the skull more 'crowded'backwards. The ichthyosaurs radiated in the Mid- and Upper Triassic of central Europe, Nevada, Spitsbergen and the Far East (Massare and Callaway, 1990; McGowan and Motani, 2003). Mixosaurus (Figure 6.7(k)) has derived paddles with short limb bones and an excess number of phalanges. Some Late Triassic ichthyosaurs reached lengths of 15 m. They had long bullet-shaped heads, teeth only at the front of the snout, a vast rib cage and tremendously elongated limbs. The later ichthyosaurs (see pp. 246-7) were important in Jurassic and Cretaceous seas, but never reached this huge size. The placodonts, pachypleurosaurs, nothosaurs and ichthyosaurs were formerly (e.g. Romer, 1966) combined in the group Euryapsida,whose ancestry was seen as rather mysterious. Since then, many authors have argued that all these marine groups are modified diapsids of one kind or another (Carroll, 1987; Massare and Calloway, 1990), and more particularly neodiapsids, with sauropterygians at least lying on the lepidosauromorph line (Rieppel, 1993, 1995, 1998). The position of the ichthyosaurs is uncertain, either as close relatives of the lepidosauromorphs too, or as an outgroup to Lepi-dosauromorpha + Archosauromorpha (Motani et al., 1998). gia, which consists of placodonts, pachypleurosaurs, nothosaurs and plesiosaurs (Storrs, 1991; Rieppel, 1993, 1995, 1998). In earlier analyses, placodonts fell between pachypleurosaurs and nothosaurs, but Riep-pel (1998) finds a monophyletic Nothosauroidea, consisting of pachypleurosaurs and nothosaurs, as is shown here (Figure 6.6).